The Bombay Sapphire Distillery and Visitor Centre has been shortlisted in the Cultural Buildings category of the Architect’s Journal annual Retrofit Awards. These awards recognise and celebrate design, engineering and construction excellence that prolongs and improves the life of the built environment. The distillery is one of 12 schemes in this category, vying for a top award at the ceremony, which will be held at The Brewery, London this September. 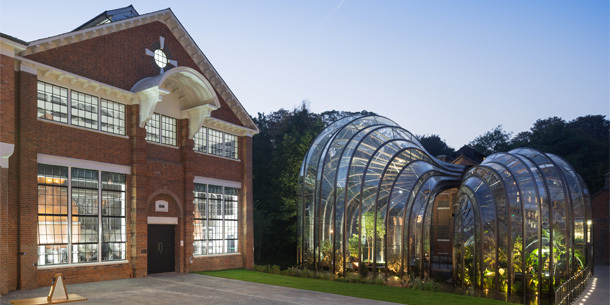 The shortlisted scheme created new premises, within an existing Victorian mill complex in rural Hampshire; for the production, storage and distribution of the globally established Bombay Sapphire Gin. The site itself is a Conservation Area, includes three Grade II listed buildings and the SSSI protected River Test that runs directly through the centre of the site. GWP Architecture and GWP Project Services worked alongside Bacardi Ltd and Bombay Sapphire to deliver this project as executive Architects and BREEAM Assessors respectively. The scheme was the first refurbishment project to achieve BREEAM ’Outstanding’ and the first distillery to achieve this benchmark.